Home > Health Care, Food, Beer, Retail, Tobacco > Medical, Health Care, Drugs > Bruker Daltonics Inc. 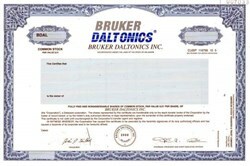 Beautifully engraved SPECIMEN certificate from the Bruker Daltonics Inc. This historic document has an ornate border around it with a vignette of the company logo. This item has the printed signatures of the Company’s Chairman, President and Chief Executive Officer and Treasurer. Bruker Daltonics Inc. is a leading manufacturer of mass spectrometry instruments and accessories for biotechnology and the life sciences. Their products include a complete variety of FTMS, MALDI-TOF, MALDI-TOF/TOF, ESI-LC/TOF, ESI-Q-q-TOF, and ESI-Ion Trap systems.